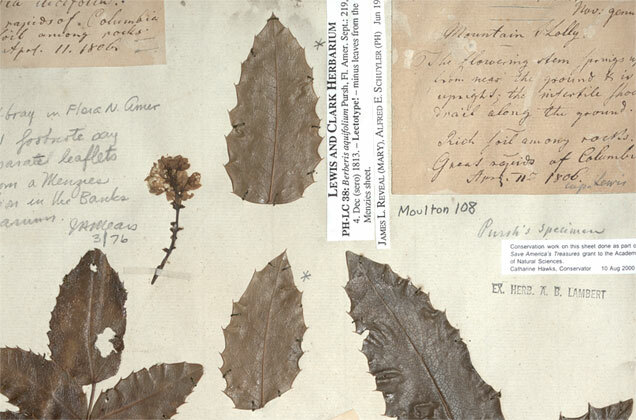 The Lewis & Clark Herbarium at the Academy of Natural Sciences of Drexel University houses almost all the plant specimens collected by Meriwether Lewis and William Clark on their journey, including many newly discovered species. The federal program Save America’s Treasures paid to rehouse the collection to modern standards. We don’t usually editorialize or advocate here, but today I’m going to make an exception. As some of our fans may have noticed, blogging hasn’t been as regular around here as our usual standard. The reason has been a time-consuming job search for one-half of the writing team of “Frances Hunter.” Fortunately that’s now resolved. Hopefully that will free up time and emotional energy for fun things like this blog. Anyone who has taken a peek at the bio section may have noticed that one of us has been fortunate enough to work in a history-related field. As of December 1, that will no longer be the case, for that job fell victim to the budget ax along with so many others in public history. – Completely eliminated: Save America’s Treasures, the program that saved countless American courthouses, document collections, battleships, historic homes, Native American sites like the Acoma Pueblo, and artifacts like the Gettysburg Cyclorama, the Rosa Parks bus, and the Star-Spangled Banner itself. – Completely eliminated: Preserve America, which helped small towns and ethnic neighborhoods plan how to preserve entire areas of historic character, developing programs like walking tours, markers, and historic drives. – Completely eliminated: Teaching American History, which provides grants for public school teachers to undertake intensive study to better teach the American story to kids. – Completely eliminated: We the People, which funded teacher training, purchased classic books and art for public schools, and sponsored the National Digital Newspaper Project, a program to digitize and put online historic American newspapers from the 1880s to the 1920s. 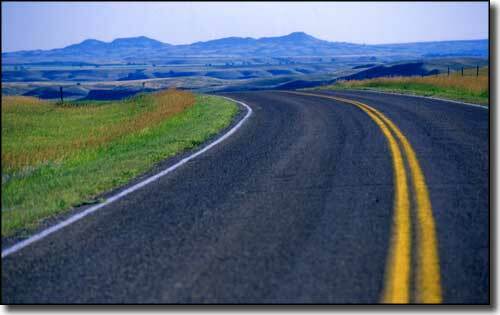 – Completely eliminated: The National Heritage and Scenic Byways program. Among many others, this ends support for the Heritage Area around the Knife River Village in North Dakota, where Lewis and Clark met Sacagawea, eliminated the chance for a National Heritage Area to preserve Lewis and Clark’s legacy on the West Coast, and ends support for scenic byways along the Lewis & Clark Trail including the Native American Scenic Byway in the Dakotas and the Northwest Passage Scenic Byway in Idaho — not to mention the Natchez Trace. The Native American Scenic Byway guides visitors through four of the reservations of the Lakota Sioux. It encompasses many of the historic sites of the Lewis & Clark Expedition. The program has been eliminated after a 20-year run. I recently found a reprint of a great book called Lost America, by Constance M. Greiff. Originally published in 1971, Lost America is a pictorial tour of landmark buildings that had been destroyed by neglect and the wrecking ball. In her introduction, Greiff has an excellent analysis of what caused the wholesale destruction of thousands of architectural treasures in our country, particularly from the 1940s to the 1970s. Much of the demolition was the result of a promise made to the nation’s veterans. The GI Bill granted low-cost mortgages to the men who had fought so gallantly in World War II. To make way for the new homes, America’s small towns and villages were converted to suburbs. Urban renewal took much of the rest. After all, what were some crummy old buildings when people needed highways to drive in from their new homes and places to park once they got there? Greiff identifies a particularly dangerous period for historical sites, writing, “We tend to denigrate the tastes of the generation or two immediately preceding our own at the same time we are attracted to the lifestyle of their predecessors, first, perhaps, as merely amusingly quaint, and then as the object of serious study and admiration … The buildings of [the] past were viewed with contempt as examples of crudity and bad taste. … They were objects to be discarded…” In another book from my library, The Gingerbread Age by John Maass (1957), the author writes of his efforts to photograph America’s Victorian heritage. There was a period of several years where Maass simply could not drive fast enough. He would get wind of a site to photograph and get there only to find out it has been torn down just days before. 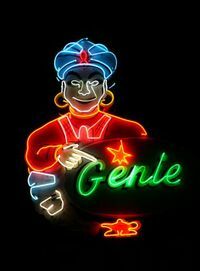 The Genie Car Wash sign (1968), Austin, Texas. 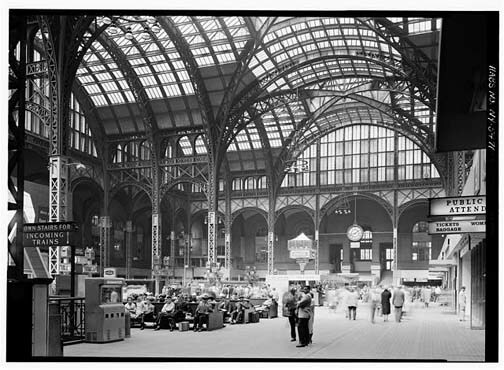 The wanton destruction of the post-war era was symbolized most dramatically by the mindless demolition of the fabulous Penn Station in New York, which eventually led to the modern preservation movement. A lot of time has passed since then. The elimination of federal funding for historic preservation says it all about the nation’s current level of commitment to its heritage — it’s not worth a dime. Similarly, states are starving their historic parks and monuments with reduced hours and maintenance, and cutting back on access and preservation of historic archives. Though the battle is ongoing, budget cuts in Georgia aim to eliminate their state archives altogether, ending public access to hundreds of years’ worth of historical documents and artifacts. A number of Lewis & Clark sites are seriously endangered. Just to cite the most recent example, a high-ranking official of the National Park Service warned that Lewis & Clark National Park in Astoria (site of Fort Clatsop) will be forever changed if a proposed terminal for liquified natural gas is built just three miles away. Visitors will no longer be able to experience the Lower Columbia River with a sense of the beauty that Lewis and Clark experienced. 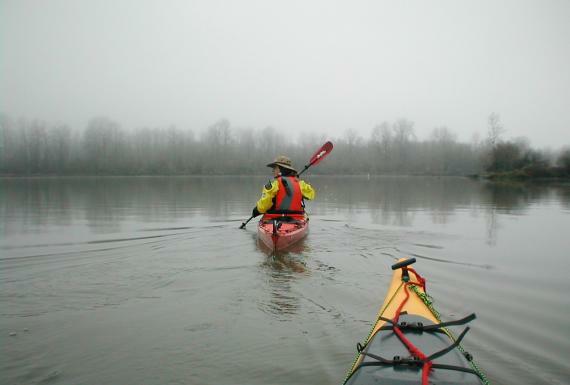 Paddlers experience the Lower Columbia River Water Trail. Courtesy Lower Columbia Estuary Partnership. What do you think? It’s all up to us, and we can’t count on any help from Uncle Sam this time around. If I ever saw a time when “think global, act local” applied, it is in the siege now underway on America’s historical treasures. What books will go unresearched and unwritten when archives are shuttered? What architectural treasures will be neglected, burned, or razed for short-term economic gain? Which of the post-war buildings, now aging themselves, will be labeled monstrosities and meet the fate of their Victorian predecessors? What sites of the Lewis & Clark Trail will be despoiled? What photographs will represent our era in a future Lost America? What will our children and grandchildren say about us? Frances, come back! You’ve been gone for nearly two years! Oh, thank you so much!!! We are still here — just have been swamped with other things. Thanks for the inspiration to pick it back up here one of these days!